You've probably thought a lot about the date of your big day, but have you considered your wedding time of day? Though late afternoon/evening is a very popular choice, wedding time can be any time you want. Here are the pros and cons of each. Pros: An evening reception is a classic choice. Your guests will feel comfortable dancing and drinking and will look fantastic in cocktail dresses and evening attire. Cons: Because it is so popular, this time of day may be more expensive. Some guests may wish to go home before the reception is over. And last but not least, a late reception means you might be too tired for wedding night intimacy. Pros: For couples on a tight budget, having an afternoon ceremony and reception can be one solution. Start things off at 1:30 or 2, wrap everything up by 6 or 7 PM and keep it all at one location. You won't need to serve a full meal, saving you thousands of dollars. Even if you do serve a late lunch, your guests will probably drink far less alcohol than they would at an evening event. 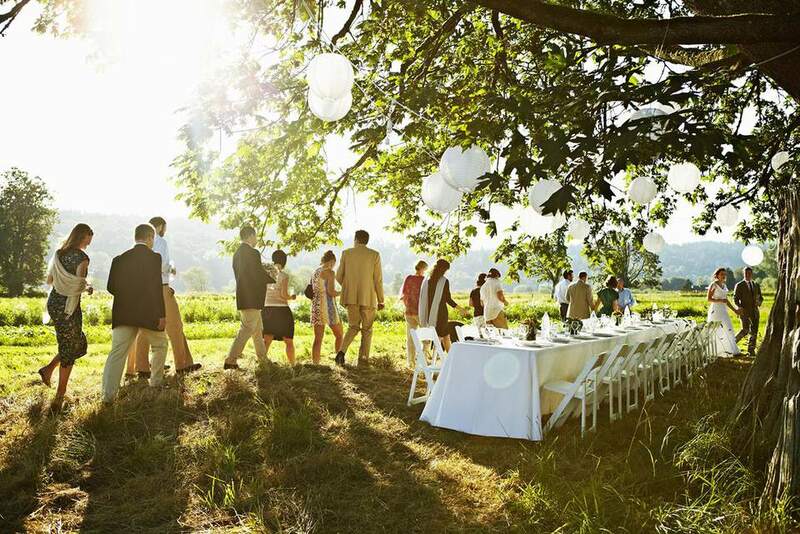 If you have an outdoor wedding, the afternoon light is warm and flattering, and you might even be able to drive off into the sunset at the end. Cons: Vendors won't be able to book another event on the same day so that they might charge more. Some guests might expect a meal regardless of the hour. Pros: Though mornings are the least common wedding time of day, they are perhaps the most traditional. Picture guests are hurrying to the ceremony wearing amazing hats—which are only appropriate during the daytime. This is probably also the cheapest wedding time of day since vendors offer discounts and brunch is less expensive than dinner. And, you'll get to wrap everything up, and then have a relaxed part of your wedding day to enjoy with your new spouse. Cons: Guests may not feel like dancing and partying so early. You'll have to get up very early to do hair and makeup, and may have trouble finding stylists willing to book such early appointments. There's no reason you can't combine two of these. Have a late morning ceremony with an afternoon reception. Or, have a late afternoon ceremony with an evening reception. If you have a large guest list, you can even do what Prince William and Princess Catherine did—have a morning ceremony followed by a simple reception for all of your guests. Then host an evening reception for a smaller group of your family and loved ones. You might have the best of both worlds.